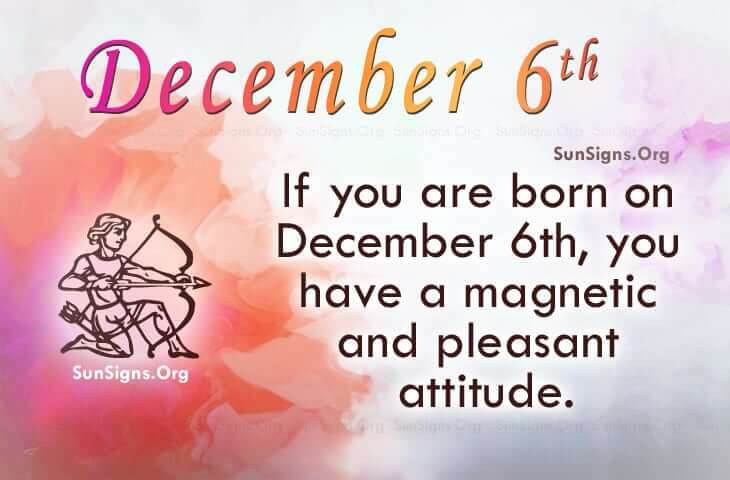 Famous people born on DECEMBER 6 have this magnetic presence. As a Sagittarius, they probably have a lot of friends. They have a pleasant attitude… they’re a bright light in their friends eyes and heart. Their family thinks the world of them. However, all know that they can be short tempered and intolerant of childish behavior. But for the most part, they keep harmony between the family. Actually, when it comes to sharing their knowledge, famous December 6 celebrities could extend their talents by teaching others. By having the talent to lead, they would make an excellent principal or work in other managerial positions. When it comes to giving advice, famous people born on December 6 are the one everyone comes to. Where it concerns their health, they should be careful of the calories they eat. Mainly, they don’t have to worry until the later years in their life or when they are not so active. Foods have a way of hanging around in places that could change the way they look in their favorite outfit. Famous people born on DECEMBER 6th ooze with charm. People are mysteriously drawn to them. If only everyone knew that they were an impatient bomb waiting to explode. Mostly, they want to have peace and happiness.